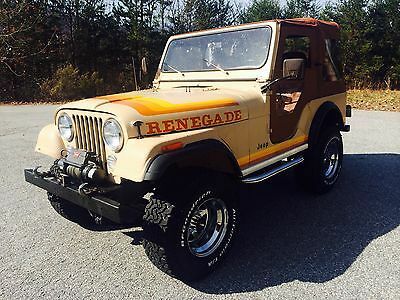 Our family used to have a cabin up in Ruidoso, New Mexico and there, under the deck sat an old CJ5 (looked like a shorter wheelbase than a CJ7) Renegade with the tan color scheme. Judging by the decals it was an '83. Anyway the floorboards were rusted out, the gauges didn't work and the soft top with the soft doors didn't do a whole lot either. I tell you though that thing ran just like a horse. Its 4x4 still worked great and that was all we used when we went up there. It would go up hills, down dirt roads, and up and down the streets of Ruidoso. However my family sold the cabin along with the Jeep as well as a quad we had. Now I'm trying to look for that old Jeep and I just can't seem to find it. Any help would be appreciated. I will post a picture that is how it looked like.